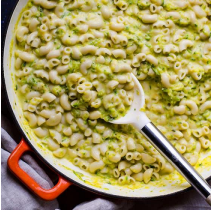 This comfort food classic is packed with extra vitamins and nutrients with the help of sautéed zucchini. minutes until zucchini is tender. Set aside in a bowl. In a large frying pan add 4 Tbs of oil over medium heat. Add flour and cook for 1 minute, stirring constantly. minutes. Remove from heat and stir in grated cheese and mix until smooth.